With a 60MM objective lens, it can gather lots more light than the average 40 mm or 50 mm unit. I am quite pleased with mine, and the only thing that is a slight drawback is that it will not focus to infinity (like for stargazing or studying the moon) while in the highest magnification setting, Back off to about 25X and you focus Ok to infinity. For surveillance work or bird watching, these units are fabulous. Complaints of them being bulky are ridiculous, since when they DESCRIBE IT as a "Large 10-30x60 Perrini Vision Zoom Binoculars...". Large being the operative word. Read the descriptions before buying. The description is accurate, they are really only a little larger than my 10X50MM binoculars, but I EXPECTED THAT! The mechanical and optical parts that allow that 10-30 zoom feature add a bit, as does the 60MM objective lens. I love my pair, and I'm not giving them up. 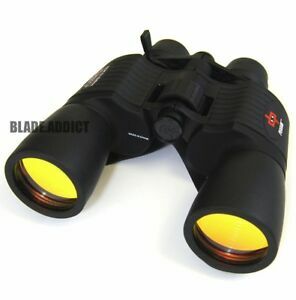 Great for spotting game when hunting at dawn or twilight. Sporting uses are practically unlimited. Paid $34.00 for them was hoping for something half way good , but these don't focus very good at any distance , buy cheap get cheap. Cumbersome to being into clear and sharp focus. Decent magnification. A tad heavy. These are lightweight and work perfect right out of the box.